The first part of this review will contain very mild general spoilers. 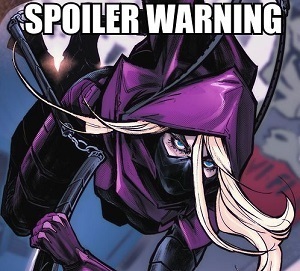 At a certain point, I’ll give a warning before I go into massive spoilers and discuss my feelings on them. Life Is Strange touches on themes of fate, destiny, and desperately trying to change outcomes. While other games have used time manipulation mechanics to give platforming, adventuring, and combat a new twist, Life Is Strange uses it to tell a deep emotional story. It’s one of the best narrative-based games I’ve ever played and I intend to play it again as soon as the shock from the ending wears off. The story is set in Arcadia Bay, a little seaside town in Oregon. Max Caulfield has just returned there to attend Blackwell Academy after living in Seattle for the past five years. The game begins by throwing you into the middle of nowhere during a storm with no context to work from – but it’s all a dream or a vision since Max soon wakes up in class where the day continues as normal. After a harrowing encounter, she discovers she has the ability to rewind time up to a few minutes. Max immediately uses this power to impress her teacher – like you do. The time manipulation mechanic doesn’t work like it does in games like Prince Of Persia: Sands Of Time. Max is unaffected by her own powers, so while the world around her reverses to whatever point it was a few minutes earlier, Max remains wherever she’s standing, keeping whatever items she may have acquired. Objects in her possession stay in her possession through the rewinding; however, they don’t duplicate. Ask a friend for $5, they give it to you. Rewind time, ask them for money again and suddenly they don’t have the money anymore, but you do and they’re very much confused as to why their lunch money has vanished into oblivion. The mechanic can lead to some fun and interesting puzzle solutions, or just give you a handy dandy “do over” when you pick the wrong option in a conversation. I would really like to have that power for social interactions. There’s an overall mystery plot involving a disappearance, abductions, corruption, and a literal storm on the horizon. Max not only uses her powers to solve the mystery, but also to help friends and make new friends along the way. One key figure in the plot is Chloe Price, Max’s best friend whom she hasn’t seen or even spoken to in five years. The relationship between Chloe and Max can change as you play the game depending on what choices you make. More than any other game in recent memory, your actions in Life Is Strange have consequences. And choices aren’t always simple yes or no, good and bad decisions. Several times I found myself stumped on a choice because there was no “right” choice and both choices had repercussions. I’m being as vague as possible for those of you who haven’t played the game yet. I really believe this is a game that you need to experience yourself. I’m about to get into very deep spoiler territory, so if you plan to buy the game at some point and want to go in spoiler-free, stop reading as soon as you see the spoiler break. If you need one last push, here it is: Life Is Strange is one of the best story-driven games I’ve ever played. Sure, some of the dialog is cringe-worthy, a few performances approach Resident Evil 1 levels of acting, and a few plot points make little sense – but this is a game worth playing. The time manipulation mechanics add fun and interesting gameplay, and add a twist to the dialog tree and moral choice systems that a lot of other games use. This game is a gem, and easily among my favorites of 2015. Welcome back. I’d like to touch on the things that had the largest impact on me while playing the game – the relationship between Max and Chloe being one of the big ones. They’re sort of estranged friends at the beginning of the game and your choices throughout the game can have either a positive or a negative impact to a certain degree. This isn’t a difference of “BFF” to “arch-nemesis”, but it can make a difference in whether Max and Chloe are just friends or girlfriends. The game does this so smoothly that both feel like natural conclusions in your game. This isn’t Skyrim’s “you want a spouse? Go out and give them a necklace” system. If you treat Max and Chloe simply as friends, they’ll be friends. If you have Max show some interest in Chloe, they wind up as something more in the end. Granted, with the nature of the ending it doesn’t make a huge difference, but it’s nice to see in the game. I know a lot of people gravitated toward the “girlfriends” thing because they got attached to Chloe through the game. The lengths Max goes to for her friend, Chloe’s heartbreaking history, and the stellar performance by Chloe’s voice actress (Ashly Burch) can make you genuinely care about the character. So much so that choices in the game become extremely difficult. Early in Episode 4, Max finds herself in an alternate timeline where Chloe has been rendered quadriplegic by a car accident. Chloe’s parents can’t keep up with the medical bills and Chloe’s respiratory system is getting weaker – meaning her death is inevitable. Chloe sends you on a fetch quest through the house for a morphine injector, and it’s pretty obvious where the game is going with this. Even knowing what was coming, when I saw the options come up I had to put my controller down and walk away from the game for a few minutes. I thought about what I would want if I were in Chloe’s situation. I thought about what I would do if I were Max in that situation. I could tell you what I chose and what my reasons were, but that wouldn’t adequately describe what I was going through in that moment. Similarly, the end of the game puts you in another situation where you have to make an impossible choice. You know what choice you should make (it’s only logical), but it doesn’t make that decision any easier. I’ve discussed this with friends, and I’ve said that if the choice were to sacrifice my best friend for hundreds of others – including many other friends – I wouldn’t be able to do it. It almost seems cold to me to reduce it to a numbers game. I was conflicted with those choices. I’m still not totally okay with the choices I made in the game. The game did that to me. The game made me feel those things. Not a lot of games do that. Most games hand you some equipment and give you some objectives but never sit you down and make you think about what you’re doing. They don’t make you think about the right thing to say to talk a friend down from a roof. They don’t make you think about the “right to die” issue. And if the needs of the many do outweigh the needs of the one, they don’t make you get emotionally attached to the one first. One last thing I want to talk about is the character of Max Caulfield. Yeah, when she gets her powers she does teenager things with them – she makes sure she says all of the right things to friends and teachers, she manipulates events to drench an enemy in paint, and she repeatedly abuses the powers of time control to undo the consequences of her own clumsiness. But she also uses those abilities to help people. She can save a friend from repeatedly getting hit in the head (seriously, I think Alyssa is destined to get smacked in the head with something – Max should stop trying to change fate), she can help a friend with a chemistry project, she can save lives. Sounds like regular good person stuff, maybe even some hero stuff. But the most impressive part for me is the beginning of Episode 4. Max has just changed history so that Chloe’s dad is alive again, but that puts Chloe in a wheelchair. In the end you’re given a choice whether to help Chloe die peacefully or not, but directly after that Max makes a choice on her own. She undoes her change to the timeline. You’re not given a choice in the matter, Max does this automatically after the choice about Chloe no matter what you do. This is done for gameplay reasons of course – you can’t have half your players choosing to continue in an alternate timeline and the other half going back to the regular timeline. But within the game, the choice says a lot about Max. In the alternate timeline, Max is popular. Victoria doesn’t hate her, everyone who picked on her before doesn’t now, her photography work is admired, Nathan isn’t threatening her, she doesn’t have to worry about an angry drug dealer stalking her, and as far as she knows there’s no one out to get her. Max has a better life in the new timeline. But what does she do? She fixes it to get Chloe back. Chloe is dead or dying from her condition, and Max immediately changes things again. There’s no mention of how changing the timeline back will affect her; the better life she has isn’t even brought up – the thing on her mind is “I need to save Chloe.” She doesn’t even hesitate. That says a lot about her character to me. If this long-winded recommendation hasn’t convinced you, I urge you to at least try the first episode. You can get it for $4.99 or less depending on if there’s a sale or not. Every now and then I see the first episode for free. It doesn’t have quite as much emotional impact as later episodes, but it’s still very very good. All five episodes will cost you $19.99 and I promise, you’ll get more than $20 worth of entertainment out of this game. Life Is Strange will make you laugh, make you cry, make you smile, punch you in the stomach, and break your heart – and it’s worth every minute. Life Is Strange is available for download on Steam, PS3, PS4, XBox 360 and XBox One. Please visit http://lifeisstrange.com/. Follow Kate on Twitter at @WearyKatie. This entry was posted in Reviews and tagged author: kate spencer, life is strange, video games by queenanthai. Bookmark the permalink.